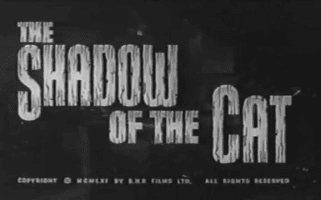 Although credited to BHP Productions (a company formed by veteran horror scribe George Baxt, Richard Finlay Hatton, and filmmaker Jon Penington in order to take advantage of a new sponsorship scheme created by the ACTT*) 1961’s The Shadow of the Cat is at heart a Hammer production.† The film was shot entirely at Bray Studios and familiar Hammer names amongst the cast and crew included André Morell, Barbara Shelley, John Gilling, Arthur Grant, and Bernard Robinson. This was in fact director John Gilling’s first directorial assignment for Hammer, and although it has not attained the cult following of The Reptile (1966) and The Plague of the Zombies (1966), it’s still a competently directed film. 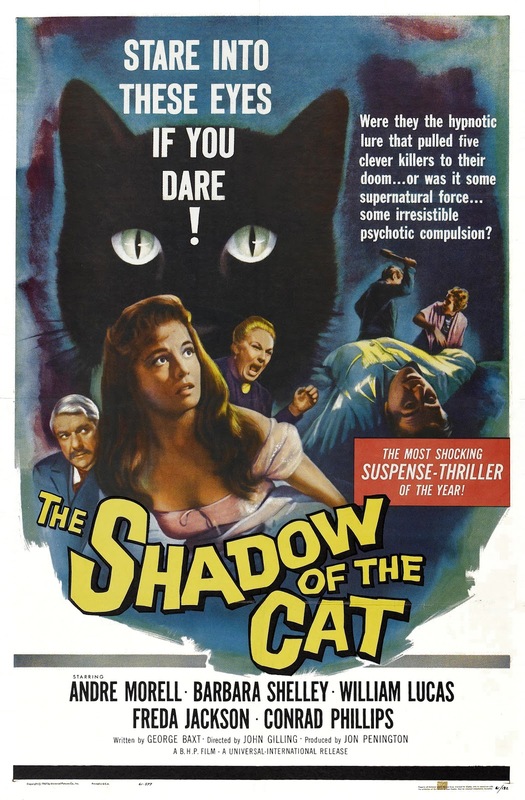 The Shadow of the Cat hasn’t really had much chance to attain any kind of following, and it remains to this day one of Hammer’s most obscure titles. One possible reason might be the rather antiquated Cat and the Canary/Old Dark House type plot, and a second might be the timidity of the narrative. It singularly lacks the blood and thunder of Hammer’s gothic horrors, and in comparison is rather stately and well mannered. Neither does it have the clever plot mechanics or high levels of suspense that Hammer’s sub-set of monochrome psychological thrillers enjoyed. 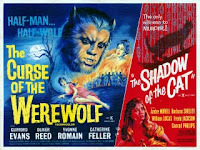 Its status as a Hammer film is open to dispute, and in my opinion quite rightly so. It is possessed of a tone and attitude that is quite unlike anything the company was making at the time, and its relative failure may have something to do with this. Nevertheless a curiosity such as this is surely deserving of a DVD release! The film opens in a suitably atmospheric fashion as the matriarch of a rambling gothic estate recites lines from Edgar Allan Poe’s feverish poem The Raven. The title of the film also evokes Poe’s gore soaked short story The Black Cat, but that is where all ties to the morbid universe of Mr. Poe end. Instead we are invited into the well trod arena of an elderly women being murdered by her relatives for the inheritance she will bequeath. The only witness to this dastardly deed? The eccentric old ladies pet cat Tabitha. The murder of Ella Venable (Catherine Lacy) is actually handled quite well, and her ensuing burial in the grounds adds to the eerie mood, as does the early revelation that the mastermind behind her extermination is none other than her husband Walter (André Morell). Morell is easily the best thing about The Shadow of the Cat. Walter is an arch manipulator, a taciturn and bad natured man, whose hatred for the cat is palpable. With consummate ease he preys on the avariciousness of Edgar (Richard Warner), Jacob (William Lucas), and Louise (Vanda Godsell) and the household servants, while at the same time uses his heart condition to tweak the emotions of Beth (Barbara Shelley). 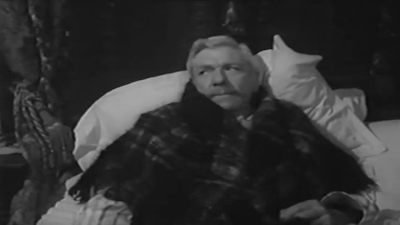 Apart from a standout scene in which Walter hunts for the cat in a creepy cobweb strewn cellar, he spends the majority of the movie bed ridden. But it is testament to this wonderfully written character that Morell can act as puppet master from the comfort of his bedroom. If Walter is the dark duplicitous heart of the movie, then Beth is the ray of purity and sunlight. Barbara Shelley brings dignity and subtlety to the role, especially impressive in the face of barnstorming displays from Richard Warner, and Andrew Crawford who plays the mean spirited and sadistic butler. But with this also comes the fact that Beth is dreadfully dull, and equally tedious is Conrad (Michael Latimer), a journalist who suspects foul play. George Baxt is to be commended for conjuring up a gallery of grotesque characters, making the villains wonderfully arrogant and self assured, and then slowly destroying their egotistical conceitedness with irrationality and hysteria. 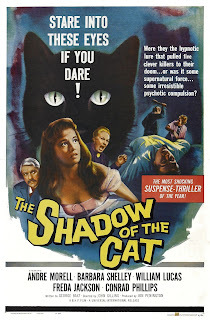 One major flaw of the film however is that the cat hardly lives up to the title of the film by staying in the shadows. Tabitha is an all too visible presence, a decision which greatly undermines any attempt to develop a supernatural undercurrent. Instead the omnipotence of the cat, and its contrived ability to pop up at the most convenient moment, creates laughter rather than terror. 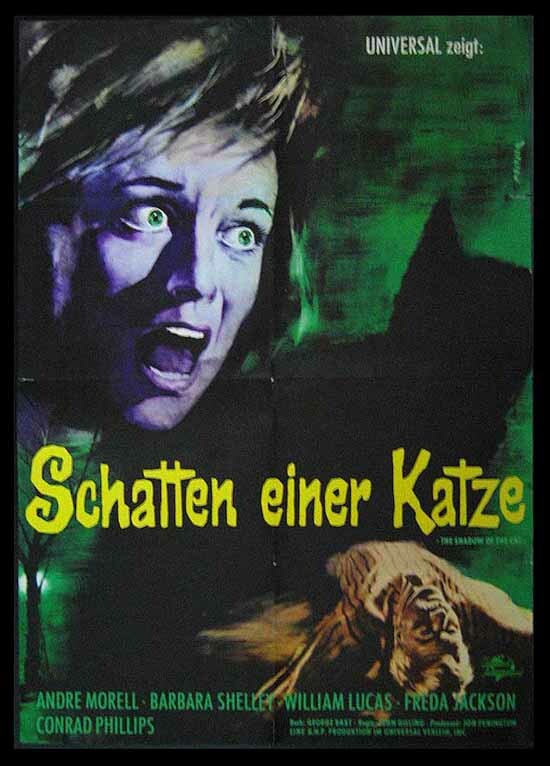 There is a certain inbuilt frisson due to a long history of cats in tales of terror and horror, but the absurd lengths certain characters go to eliminate the pesky feline robs the film of any tension. This reaches a nadir of stupidity when Jacob scales the roof of the house to catch the cat and falls to his death. Far more successful is an earlier scene in which the butler chases the cat into a nearby wood and perishes in a quagmire. Tabitha also fails as a metaphor for the guilty conscience of the murderers. The reason being that the question of guilt or conscience never arises. None of the villains express a scintilla of regret, and there is nothing in the film to suggest that they wish to repent for their evil deeds. If anything the cat makes them more determined to succeed. So ultimately Tabitha’s behaviour is not supernatural, and if it is, plot contrivance totally destroys it. Nor is the cat a reflection of a murderers guilt. So one can only conclude that Tabitha is actively seeking to avenge the death of her mistress! That the cat succeeds, ultimately indicates the stupidity of this enterprise. But The Shadow of the Cat is not without its charms. 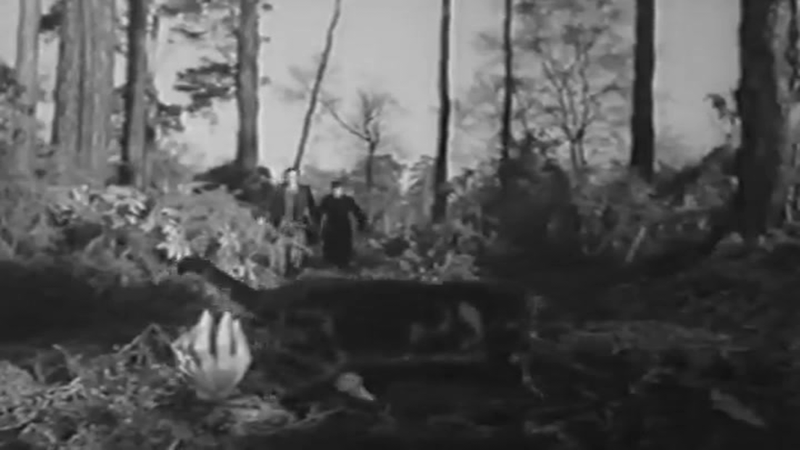 It boasts some excellent performances, saturated gothic hues courtesy of production designer Bernard Robinson, a Lewton-esque atmosphere thanks to Arthur Grant’s monochrome cinematography, and some occasional inspiration from the director. The best of which is a stretched wide-screen shot that functions as a point-of-view for the resourceful feline. I've never heard of that one but Gilling was a fine director. 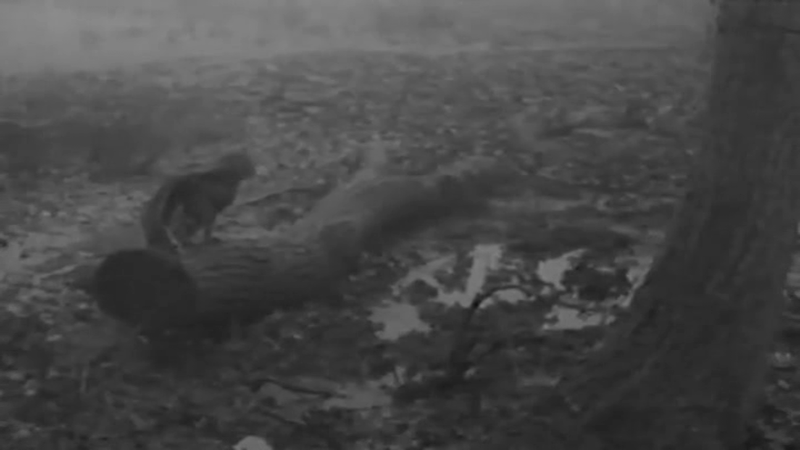 I agree with your assessment of this film, but give the cat and its handler credit. That is the best and most believable performance by a feline ever. The handler of the cat and the editing make her vengeful plotting believable. You admit it yourself when you observe her as a "resourceful feline". This is very fine directing of a very independent minded animal. 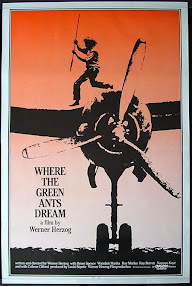 I am looking for a film my grandpa saw years ago, and this one fits the description. I just need to know if this movie's final scene is set in a swamp?